Global food availability is out of balance, although the total amount of food currently produced is sufficient. Currently more than one billion people suffer from hunger and a little less than two billion people suffer from overweight. That confirms imbalance not shortage. However the current situation will get tight. The global human population will grow by further two billion people, or more than a quarter, before it stabilizes around year 2050. These additional people have to be nourished using the land currently available. Global food production patterns have to change to secure that, meat production seems to be an appropriate target to free resources [*]. Those who can pay for it. At least 80% of humanity lives on less than $10 a day and the poorest 40% of the world's population accounts for 5% of global income. The richest fifth of the world's population accounts for 75% of world income. The poorest fifth for just 1.5% [b]. The richest fifth of the world's population (1) eat most of the meat that is produced on the planet because they can afford it; and their choice determines the pattern of global production of meat. Many, even most people like to eat meat. Our evolution set our species on a trail to live on a variable diet; e.g. vegetables, fruits, grains from plants and meat from animals or fish. However, only the better off on this planet have the choice “what to eat”. The World Bank noted already in 2011 that global food prices are reaching dangerous levels. Rising food prices threaten to push millions of people into poverty and put particular pressure on the most vulnerable, who already spend more than half their income on food. Thus many people simply eat “what they can get”. How do we produce our – daily - meat? Pastures cover 60% of agricultural land, forage meanwhile occupies 35% of agricultural land. Thus in total, 81% of agricultural land are dedicated to livestock and its feed. Animal production in developed countries imports 80% of the proteins feed; mainly soya. Additionally, the irrigation of feed crops for cattle accounts for nearly 8% of global human water use, animal production causes 18% of the global greenhouse gas production, and manure affluent to the sea occasional cause algae blooms and “green tides”. In 2005 global animal production has used 742 million tons of grain, or about 250g grain per day and person of the global population. In 2009 more than 40% of global production of corn, wheat and barley was used for animal production; and 60% was used for all other uses, food and non-food. Animal production makes up for about 40% of the global agriculture production, and corresponds to 2% of the global GDP (2). Thus globally we use a very high fraction of land and water resources for a relatively minor total output. Beef, pork or poultry - not the same game. The relationship between meat production and cereal input varies for beef, pork or poultry. It takes at least seven kilograms of grain to provide a single kilogram of beef, four kilograms of grain for a kilo of pork, two kilograms of grain for a kilo of poultry. Thus beef production is the least efficient use of grain and poultry production is the most effective; for the same amount of grain you get either two kilogram beef or seven kilogram poultry. The annual global production of meat is about 280 million tons or 40 kg per person and year, a level of consumption recently reached for China or about one third of the consumption in the US. Most meat produced meat is poultry. The ratio of global production of beef, pork and poultry is about 25%, 35% and 40%, respectively. The ratio of grain production needed to produce these amounts of beef, pork or poultry however is 45%, 35% and 25%, respectively. Thus beef is the wolverine devouring most of the grain. Action – target the beef. Reducing meat production would reduce demand for grain. Reducing beef production would reduce most efficiently demand for grain. Capping beef production at a little less than half of the current level, thus from 45% grain consumption to 20% grain consumption, would free grain to double poultry production. This shift of meat production pattern would increase the global meat production by about 25% without changing total meat consumption for meat-eaters. Another evident choice, however, is to consume less meat (beef) and have more grain to nourish human beings, as likely will be needed by 2050. The amount of grain necessary to nourish more people could be made available by capping beef production. Only a tiny fraction of the 25% increase of global population (plus 2 billion people) by 2050 will be among the richest fifth of the world's population; the main beef-eater (**). The additional people to nourish by 2050 are mainly grain-eater and only occasional meat-eaters. Thus, capping beef production in favour of making more grain available for direct consumption by people would provide food additional food resources. These resources will be needed to nourish the global population of 2050. Halving the beef consumption of the richest fifth of the global population could free the resources to feed additional two billion poor people, in first instance and to current, although insufficient, standards. 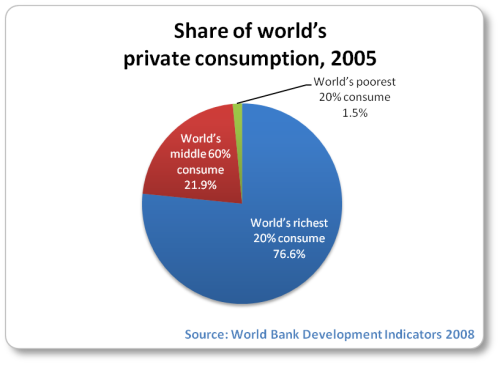 A modest change of consumption pattern for the richest fifth of the world population to free resources to nourish two billion human beings more. Daydreaming? (**) p.s "Farm animal populations continue to increase worldwide. The number of chickens grown for human consumption increased 169 percent between 1980 and 2010, from 7.2 billion to 19.4 billion.1 During the same period, the population of goats and sheep reached 2 billion, and the cattle population grew 17 percent to reach 1.4 billion.... The Consultative Group on International Agricultural Research estimates that by 2050 the global poultry population will grow to nearly 35 billion, the goat and sheep population to 2.7 billion, and the cattle population to 2.6 billion animals." (found 27thJune: http://vitalsigns.worldwatch.org/vs-trend/farm-animal-populations-continue-grow) - thus, cattle population forecasted to double by 2050? (1) That includes the author and probably all readers. (2) Worldbank figures indicate that the 2% estimate may be too high.